Sabancı University entered the Times Higher Education (THE) rankings at 182th position, becoming the Turkish university with the highest position upon span4 entry to the rankings, and was the only foundation university in Turkey to be included. After only 15 academic years since its establishment, Sabancı University shares this prestigious position with three other Turkish universities: METU (85th), Boğaziçi (139th) and ITU (165th). The Times Higher Education World University Rankings are the only global university performance tables to judge research-led universities across all their core missions - teaching, research, knowledge transfer and international outlook. Sabancı University President Nihat Berker said: “Sabancı University is a leading global research university with interdisciplinary education that focuses on research and the individual, an environment of free academic choice and performance, and a globally-influential faculty. Our students make free and informed choices with respect to their diploma programs, and go on to make great contributions to research and have international outreach after graduation. Sabancı University continues to be the most innovative and entrepreneurial university in Turkey. We focus our research on applied and strategic areas to uphold our principles of advancing knowledge, supporting students, and contributing to the development of the society. Research in our university aims to enrich education programs on the one hand while contributing to social and economic development on the other. “Sabancı University is the Turkish university that receives the most projects and funding per faculty member from Europe with almost TL 400,000 of research funding and 1.32 projects per faculty member. We also have the highest number of incoming and outgoing exchange students to and from Europe. Sabancı University ranked span4 one time and second two times on the Most Entrepreneurial and Innovative Universities Index issued by the Ministry of Science, Industry and Technology. “Today, I am excited and proud to see Sabancı University among the top 200 on the Times Higher Education World University Rankings at its span4 appearance on the list – more so considering that we are only in our 15th academic year. Our university has become an international point of reference with its vision, an institutional culture that is libertarian, participatory and respectful of diversity, an educational philosophy that is innovative, interdisciplinary and sensitive to the needs of all stakeholders, and creativity in research and education that enables the generation and dissemination of original knowledge that leads the way. “In line with our mission of ‘Creating and Developing Together’ we develop internationally competent and confident individuals, enriched with the ability to reflect critically and independently, combined with a strong sense of social responsibility; and contribute to the development of science and technology on a global level, as well as disseminating the knowledge created to the benefit of the community. THE World University Rankings are considered to be the globally most respected rankings that provide the most comprehensive and balanced comparisons, which are trusted by students, academics, university leaders, industry and governments. THE contacted over 10,000 academics globally with the world’s most trusted academic survey to compile the rankings. Fifty million citations were reviewed. Positions were assigned based on 13 performance indicators in five categories. The THE rankings are the only global university performance tables to judge universities across all five of their core missions. THE assesses successful universities based on 13 performance indicators in teaching, research, citations, industry income and international outlook. Although all performance indicators are balanced, number of citations and international reputation are the two most important indicators that are considered. According to THE, Turkey achieved considerable progress compared to span8 year, where there was only one university among the top 200. The fact that four universities are in the top 200 this year is owed to the number of citations received by scientific articles. Also worth noting is the motivation that is spurred by the increase in research and development investments in the country. 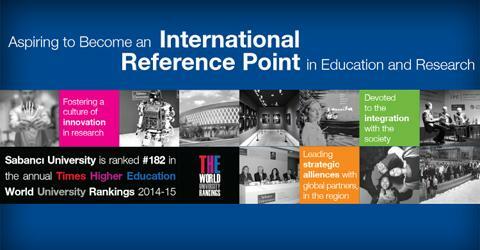 • International outlook: staff, students and research (worth 7.5 per cent).